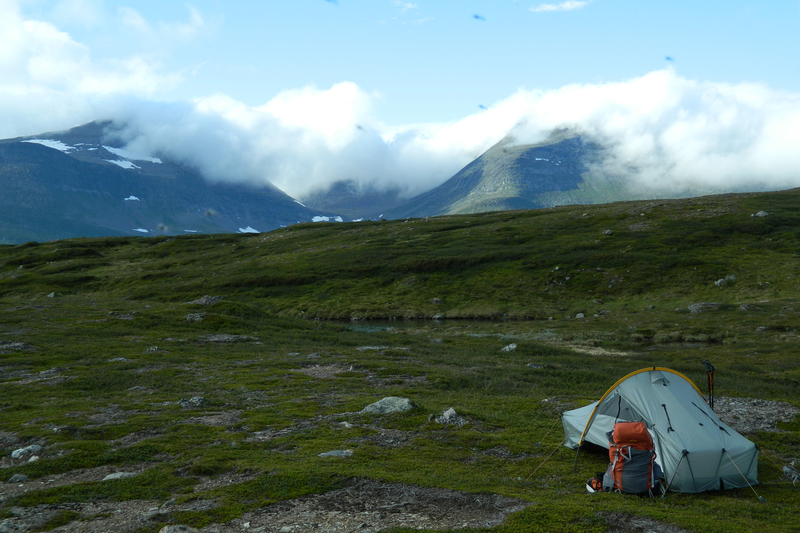 In the midst of Borgafjäll, a remote mountain range in Sweden’s sub-arctic, I pitch camp after another long day’s hiking. The intention is an early bed, it’s been a hot day and I’ve covered around 35 kilometres carrying all I’ll need to live comfortably in Lapland’s wilderness for another 7 days. Just as I almost fall asleep I am disturbed by the sound of an aircraft, at odds with my remote location. The Sámi are herding reindeer by helicopter! I look out and see a herd being driven off the high fells by a helicopter that’s now visible. The reindeer, to escape the heat of the day, have scattered on the high ground and as the day cools the Sámi want them down. The helicopter buzzes the herd as they corkscrew to the valley. A medley of engines for an hour and then the ground reverberates. Hundreds of reindeer stream past my tent and then settle nearby to graze by the side of a tarn. I hear the helicopter land high up and so decide to take a look. The helicopter is perched up on Västra Fjällfallet. The pilot and his companion have climbed out. Cries ring out in the night sky, an exclamation of joy. And why not, it’s a little after midnight on a perfect summer’s night and light still fills the sky. It’s the stuff of life itself. That’s northern Scandinavia in essence. The outlying tip of our northern European continent and culture, part of some of the most developed nations in the world but undisputed wilderness, the home of Europe’s last nomads and an almost magnetic pull to many seeking adventure. The wild lands of Norway, Sweden and Finland are vast, far surpassing in size any other European wild land and stretching well north of the Arctic Circle. There are icecaps here, and glaciers, as well as rugged mountains reaching to over 2,500 metres in height; vast upland plateaux, huge tracts of boreal forest, crashing waterfalls, wild rivers, myriads of lakes and of course the dramatic and beautiful fjords. I spent a whole Nordic summer travelling through that wilderness. A single journey on foot through constant daylight that saw me climb from the forests of Dalarna with its bears and elk to empty tundra high above the Arctic Circle where once the empire of the Russian Tsars extended. An incongruous start though – three years before on a commuter train bound for London, an article in the Swedish press held me in the midst of the daily journey to work. A collective of Swedish outdoor brands, including Primus and Hilleberg, were sponsoring an award marking journeys the length of Sweden’s mountains. Around 1,000 miles separates the two ends of this mountain chain that rises in southern Norway and heads north over the Arctic Circle before slowing to the Barents’ Sea. To some the chain is called ‘Skanderna’, to others ‘Nord-Ryggen’. Journeys through them are as old as man but until the initiative of Annica and Torkel Ideström, two Swedish wilderness guides, only Norway formally marked the endeavour of a single traverse with her renowned ‘Norge På Längs’ (‘the Length of Norway’). Sweden has seen similar enterprises, but the award of the ‘Gröna Bandet’ (the ‘green ribbon’ for a summer foot journey) or ‘Vita Bandet’ (the ‘white ribbon’ for a winter ski or husky journey) now provides that same recognition. It’s thrown up some memorable adventures already in the last three years, fairly ordinary folk undertaking an extraordinary journey. From days of skiing in minus 30, to husky teams fuelled by frozen fish or walks such as mine; remote backpacking of reindeer migration routes, tracks, trails or miles of tundra. All undertaken in Europe’s last wilderness. I’ve had my foot in these mountains since marriage to a Swede. A honeymoon to remote Härjedalen had me wide-eyed atop the summit of ‘Stor-Vigelen’. Wave upon wave of peaks and forest marched north from our viewpoint, unchallenged by human habitation – and to me, irresistible. These peaks are the senior partner in the Caledonian mountain chain, consequently they feel familiar but the extent of them is a hundredfold. Wilderness undoubtedly, but it’s also ‘Sápmi’, the lands of the Sámi people who occupy the northern arc of Scandinavia and north-west Russia. Sweden’s fells provide the Sámi with both context and with reindeer husbandry, a way of life practised since the Stone Age and the domestication of reindeer, but now underscored by the technology of advanced Nordic nations. The land remains constant though. Virgin forest and tundra bogs alternate with fell and marshland, punctuated by fast watercourses and the exclamation of alpine peaks and glaciers. It’s also home to bears, wolverine, elk and the eagle – the big boreal beasts holding fast in a last European redoubt. The ‘Gröna Bandet’ is a fairly simple concept, it’s a point to point walk. You either start or finish at the southern mountain station of Grovelsjön (where the fells break from the confines of deep forest to stride north) with the corresponding start or finish at the lonely border stone of Treriksröset (high above the Arctic circle, where Finland, Sweden and Norway meet), a little under 1,000 miles. There are rules, you are expected to travel under your own steam and provide for yourself. Supply boxes achieve this. The route, deliciously, is of your own device. Scandinavia’s extended trail network offers a fast-track at points with not only the world famous Kungsleden in Lapland but also a myriad of options. Passage through Norway is allowed too and a system of open wilderness huts adds support in both countries. This is hiking country to match the vast spaces of North America, a little bit of walking experience can unlock vast tracts of sub-arctic wilderness and with the guarantee by law of open access (‘Allemansrhatten’), you are free to camp and walk at will. At the end of June 2013, I found myself on a bus bound for Grovelsjön in Sweden’s county of Dalarna. Here the rise of the mountains as low fells began to break free from deep forest, rocky islands in a verdant sea. I’d opted for a southern start, commencing a journey of around 60 days north. Six stages in total, supply boxes and rest days (‘town stops’) punctuating the walk at key points. My first stage had the benefit of good trails, a chance to ease myself in over 8 days. 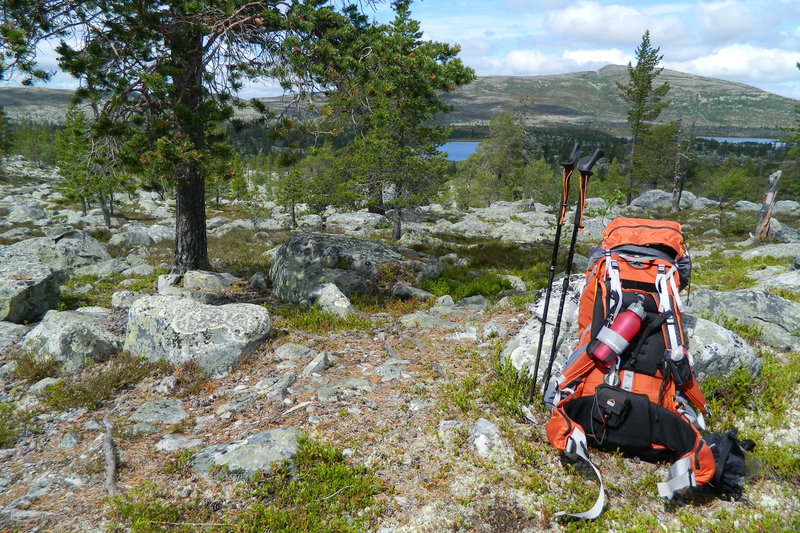 I was following the ‘Southern Kungsleden’, a fine walk through some of Sweden’s southern mountains and moors. Decades ago the ambition was to extend Lapland’s ‘Kungsleden’ to around 1,000 miles. This never happened but the moniker is used to describe the trail network in the south. Less travelled than its northern counterpart, it avoids much of its sibling’s hyperbole. I was certainly looking forward to it, initial days through Rogen and a tantalising mix of lake, fell and ancient forest. The resulting first hours were happy, climbing through scattered birch, green in early summer, then emerging onto open fell for the first time. I’d begun. But just like the counterpoints of the midnight sun versus the polar night, the walk mixed ease with toil. I learnt that quickly. My first memorable camp settled lingering nerves, a soft grassy pitch by a sparkling high tarn on a warm and sunny evening. Two months I thought, two whole months of backpacking and nothing else! That fairly delicious sentiment was underscored by trail markers disappearing across the plateau, a shimmering promise in the evening’s heat. But within a couple of days the reality of a long wild walk hit. Day three saw a skirmish north of Skedbrostugan after losing the trail in thick forest. I could see the fell some miles ahead but a wall of lakes and forest obscured my progress. Bitter frustration and near exhaustion experienced over the obstacles of ancient moraine and birch forest. A rough camp followed until my escape late morning the next day. A return to a favoured pitch soothed my humour before the next travail and a serious problem with my rucksack. Fate dealt a solution and a memorable encounter of the walk. Camped by a tumble-down hut a dishevelled figure approaches and I meet Robert, a German light-hiker. Robert is typical of the many drawn into Scandinavia’s big spaces – it’s a natural home for the maverick. On his own long hike he travelled very light, making his own gear at home and from rubbish found on the trail. Mixing ‘cottage’ with ‘garbage’, he jokes. We inspect some of the fruits of his labours. An impressive homemade stove fashioned out of tin cans. Stuff sacks and pouches, made from discarded leather and plastic. A pair of walking poles caught my eye: a modified golf club the genesis of one, its partner a snooker cue (both with leather hand straps fitted expertly). A meths bottle fixes my pack and so I later press surplus food into Robert’s receptive hands. We walk together the next day, finding out a little more about each other as we make good progress northwards. Robert’s a German, in his forties, who lives a peripatetic life. Summers are on the ‘road’, as he describes it. Using an old bicycle he cycles around Europe or near Asia, hopping off to hike. This summer it’s a tour of Scandinavia and the Baltic. His life is light like his travelling. During the winters he lives in Germany, wherever he can find work. A carpenter by trade, money is never plentiful and what’s spare is saved for his summer wanderings. Trails, huts and passing people mark this stage of the journey. 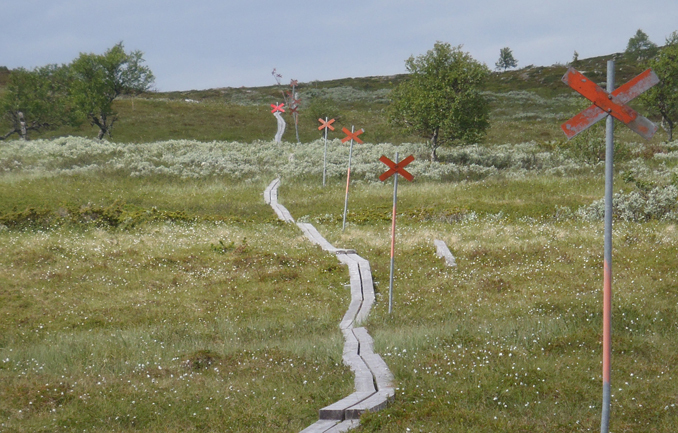 It’s the popular hiking area of the Jämtland triangle. Robert and I part as he heads north and I turn past the busy mountain station of Helags heading eastwards. Two days on the well maintained trail network pass quickly. After a week I’ve settled into a rhythm. The alarm goes off at 6.30 am as usual. I need thirty minutes to think about getting up at 7! I’ve stuck to the plan so far of being away by 8.30 in the morning. One and a half hours to brew up, eat, toilet and pack up. Easy in the fine spell of weather I’ve enjoyed since I left Dalarna a week ago. As I near the end of the trail network at Vålådalen, I am conscious that this is the last day on a well developed trail network for a while. 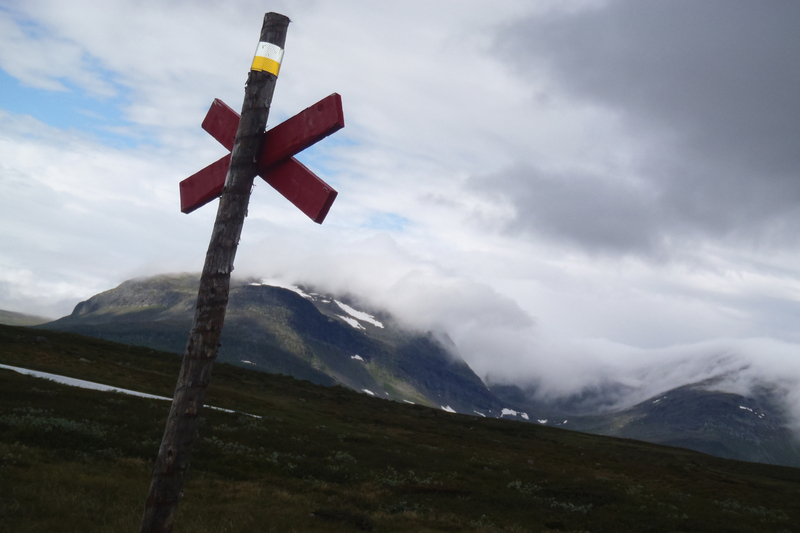 That notion turns out to be well-founded – I don’t meet any other hikers or backpackers until I hit the southern terminus of the ‘Kungsleden’ in Hemavan, many, many hundreds of kilometres and several weeks away. Sweden’s mountain walking is concentrated into two or three areas – there’s a lot of space out there underused. As a consequence though there’s a hard day cross country to my town stop at Duved and the opportunity for rest and resupply. Heading north from the easy trails of Jämtland and Härjedalen to the supply stop at Duved offers the walker, the ‘Gröna Bandare’, a real conundrum. The well-defined tracks and trails simply stop. Instead, there’s a wall of forest, bog and lakes, at least a day’s hard walking, between the walker and the ‘shangri la’ of the first rest stop with hot food, water and respite from the elements. The alternative is a longer walk of a couple of days around this on road. Study of the map shows gaps in the bush that might be exploited. One or two small paths, some openings in the thick forest and ‘kalfjall’ that, I thought, would offer easy walking and quick miles once above the tree line. That day’s walking however, proves simply exhausting, a hard struggle through thick forest and soaking bog as I follow a compass line. At one point I stop exhausted, in despair and with sweat pouring off me. I notice movement ahead and a few feet in front of me stand an elk cow and calf. Potentially dangerous but I was spellbound, very much in their world. That moment lasted a few seconds and then they bolted, leaving me elated at this wild encounter. Hours later a total contrast as I tumble out of the bush into the sparkling ski resort of Åre. I find myself standing bemused in a busy supermarket, fundamentally hungry but simply overwhelmed by the choice on offer. Stage 1 was finished though, an opportunity for rest and respite before continuing the long journey north. Mark chose the Pasco Jacket, Grid Technic and Velez Adventure Trousers for his 1,000 mile walk. Is there a book to accompany this as the blog is an exceptional read? Thank you for sharing your experience. My son having just moved to Sweden, I am very keen to explore its Nordic landscape this summer. Any tips on where to start from based on your journey? Both, thank you for your comments. Kevin, no book but there should be more to come on this blog thanks to Páramo. 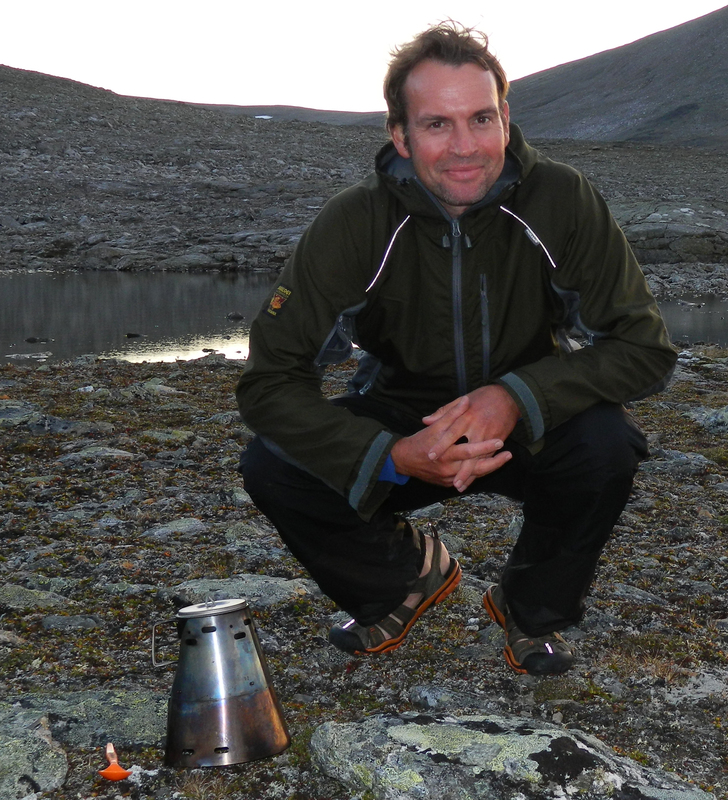 Fabrice, lots to see in Sweden’s north. 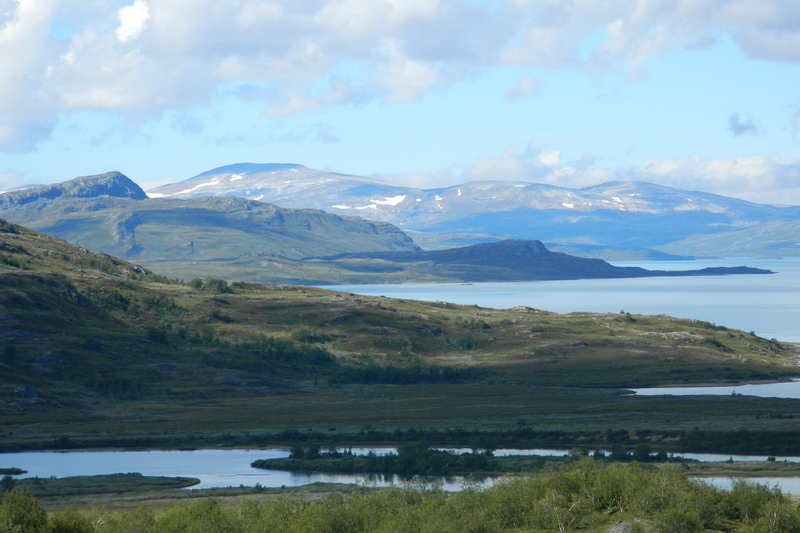 A good place to start might well be either Grovelsjon in Dalarna or Abisko in the far north. You can either start a long distance adventure from there or do day trips from the comfortable mountain stations. Enjoy!